One of my favourite things about decorating for Christmas is creating our Christmas table decor. It's always fun to go through my dishes and table accessories to decide how to mix and match my cherished items. 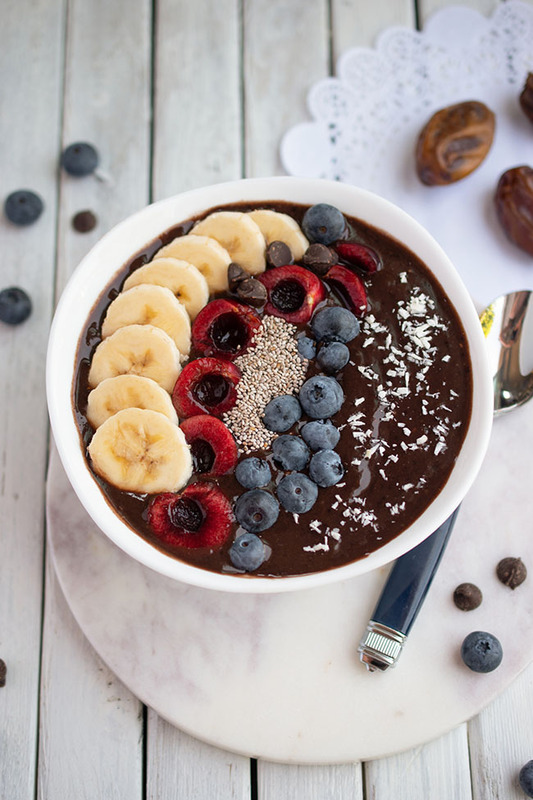 If you have the time, it's nice to add a few personalized DIY touches too. I am a big fan of gold glitter, in both cardstock and iron-on materials. But I also like the fresh, crisp look of silver glitter. 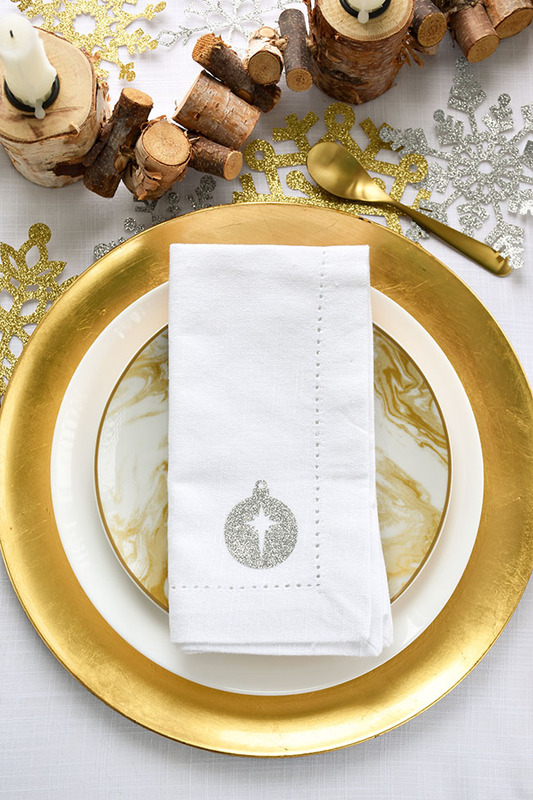 So I decided to set my holiday table with mixed metallics, using DIY Christmas napkin designs in both warm gold glitter and crisp silver glitter iron-on. 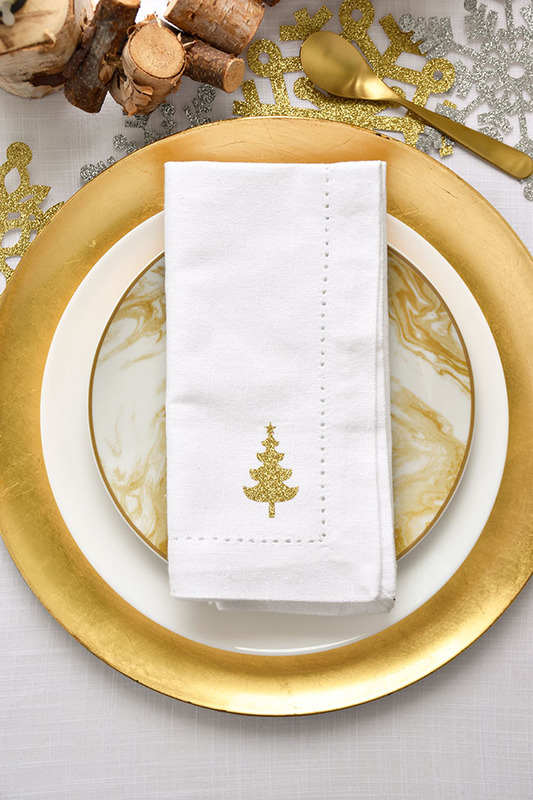 It's quite simple to create these holiday napkins. Read on for the tutorial. 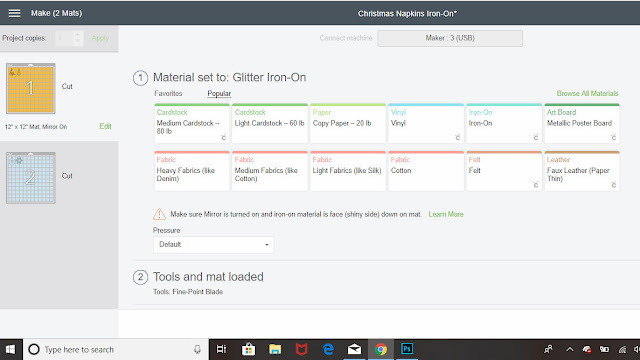 Create or access the file in Cricut Design Space. For my four napkins, I selected four different images from the many images available in Design Space. I thought it would be fun if each person in the family had their own designated napkin. 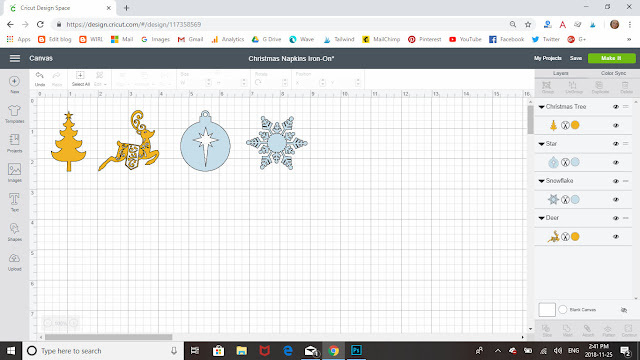 I chose a Christmas tree, a reindeer, an ornament and a snowflake. On the screen, I made two of the images an icy blue and two a gold colour, to be cut from silver and gold glitter iron-on material, respectively. If you want to use these same images, you can easily do so by accessing my file in Design Space. Choose "Customize" to change the size or other features of the images. Or go right to "Make It" to cut them as is. Turn on the "Mirror" function (circled above) in the mat preparation screen. With some images, like the Christmas tree, it won't matter in the end, but I think it's good to get in the habit of mirroring your iron-on images so you'll remember when it counts. Press "Continue." Cut the iron-on material to size and apply to the cutting mat liner/shiny side down. If you're not sure which mat to use for any given project, you can consult Cricut. For this project, I used the StandardGrip (green) cutting mat. 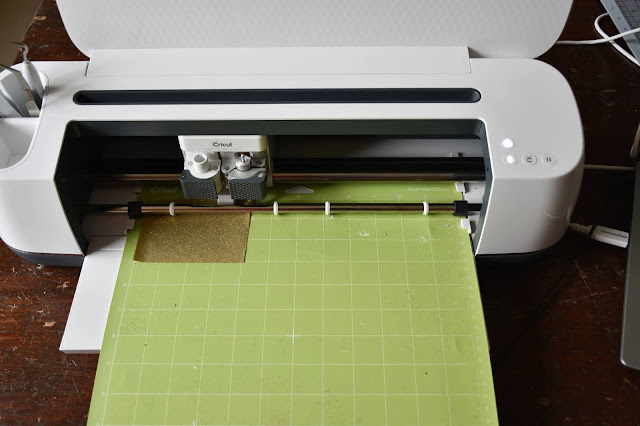 Once the Cricut Maker has completed the cuts, weed away excess iron-on material using a Cricut weeding tool. You'll want to be careful at this stage, because some of the cuts are very small and you don't want to damage your iron-on image, particularly with the reindeer. I actually started out cutting a little Christmas tree that had ornaments, but I found the ornaments ended up being too small for me to see and weed away, so I made the Christmas tree solid. 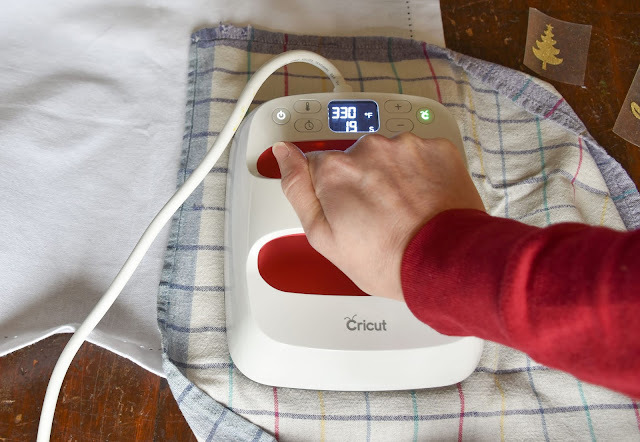 Cricut's new EasyPress 2 comes in three convenient sizes for all of your iron-on projects. From the petite 6" x 7" to the 12" x 10" XL, the Cricut EasyPress 2 family can create everything from an adorable onesie to a fun, personalized T-shirt to banners and throw blankets. While you could use a regular home iron to do this project, I find the EasyPress 2 is much easier. Its smooth, flat, ceramic-coated heat plate provides consistent heating edge-to-edge, creating more reliable iron-on results, so that your project is secure and will last long-term. Essentially, you get the professional iron-on results of a heat press in a more convenient, portable and easy to store format. EasyPress 2 heats up to 400°F and adheres iron-on materials in just 60 seconds or less. 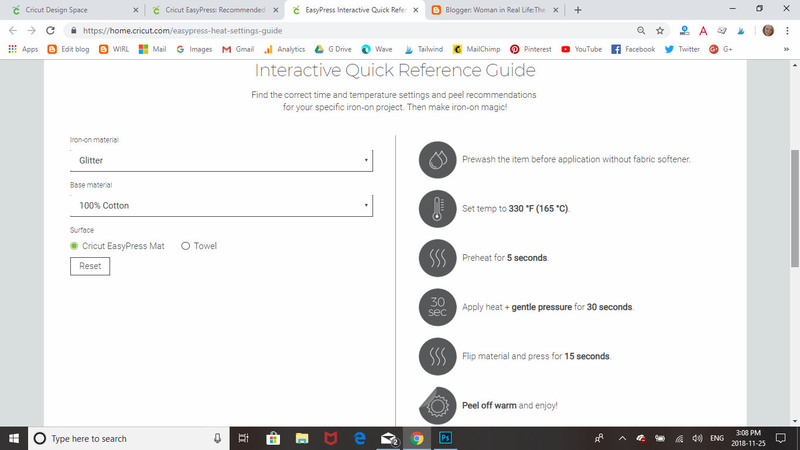 To determine the right heat and time settings for your materials, consult Cricut's interactive quick reference guide. In this case, I entered "Glitter" as the iron-on material and "100% Cotton" as my napkin fabric. The guide instructs me to set the temperature to 330°F. Because the napkins are small in size, I went with the petite EasyPress 2 and the coordinating mat. 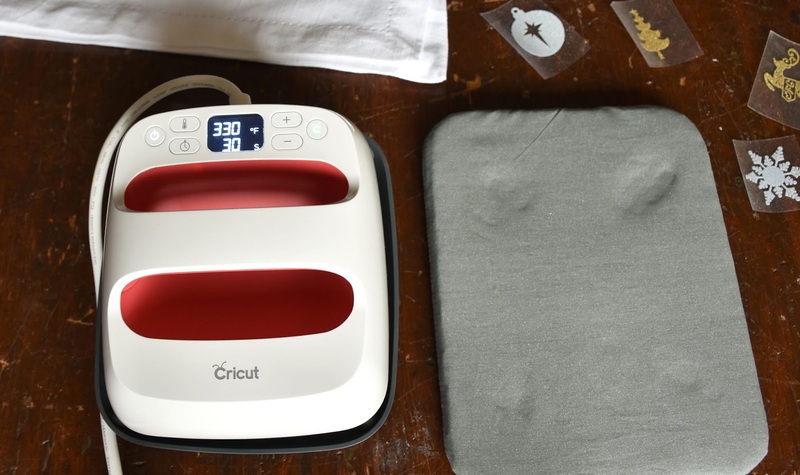 Each mat (they come in three sizes to coordinate with the machines) has five layers of heat-resistant, moisture-wicking insulation to create foolproof iron-on results. 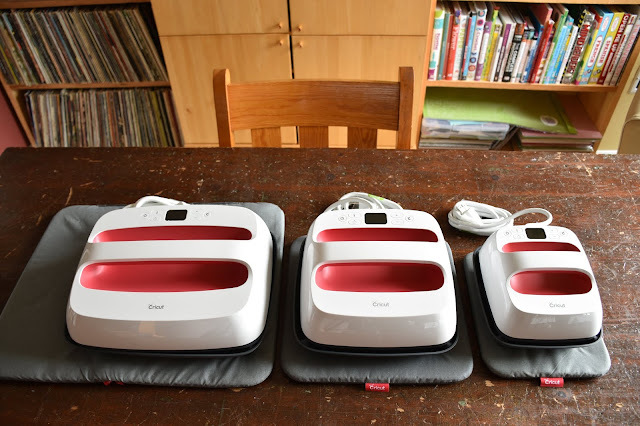 It's not recommended that you do iron-on projects on an ironing board, because you need more stability. Work on a good, solid table and use the mat to protect your surface. Then all you have to do is plug in the EasyPress 2, select your heat and time settings and it's ready to go in no time! The EasyPress 2 sits on an insulated safety base so it keeps your work surface (and your home!) safe, another key advantage over a home iron. The auto shut-off feature turns the machine off after 10 minutes without use. 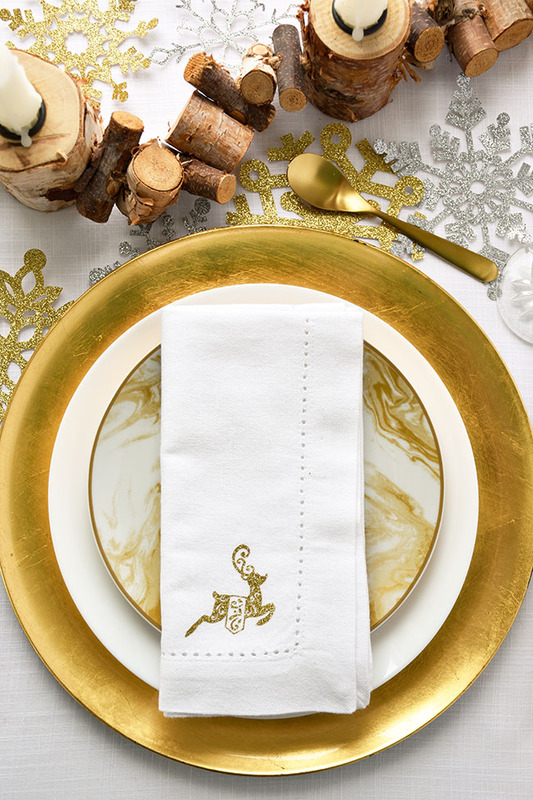 This project is so easy to do and I love how it creates a pretty, festive and personal touch to the napkins for our holiday table. I also cut some snowflakes from silver and gold glitter cardstock to dress the centre of the table. Search for "snowflakes" in the images in Design Space and you'll get a ton of options. This little reindeer required a bit more care in the weeding stage but it's well worth the bit of extra trouble, I think. I'm also a fan of the silver snowflake. I think it would be pretty in a larger size, ironed onto a tablecloth or a Christmas gift bag. How is EasyPress 2 different from EasyPress 1? If you have the original EasyPress, it's a great machine too. But if you're wondering what the differences are between EasyPress 1 and EasyPress 2, let me tell you. reaches a higher temperature, up to 400°F (205°C). This wider heat range handles more iron-on applications. remembers time and temperature settings from your last use so you can get started on your next project faster. heats up about 25% faster. 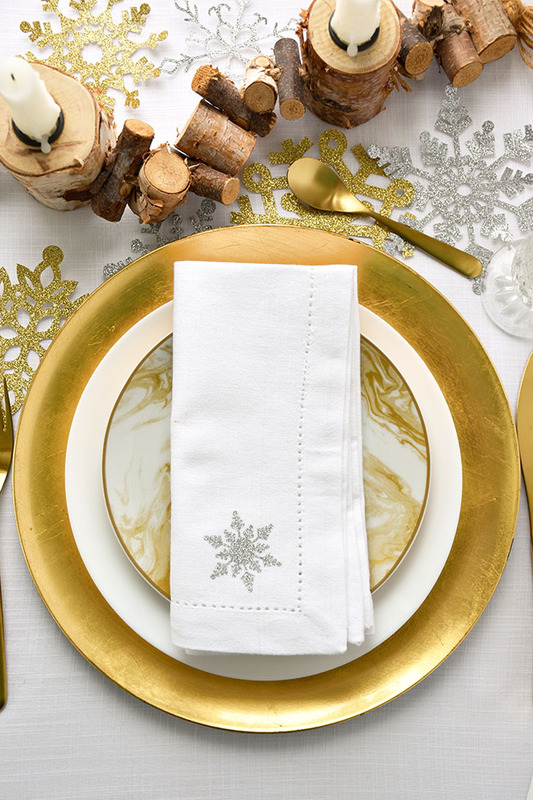 Do you like to add DIY touches to your holiday table? Do you like silver or gold, or are you unable to decide, like me? Have you done any iron-on projects? This is so beautiful Joann. 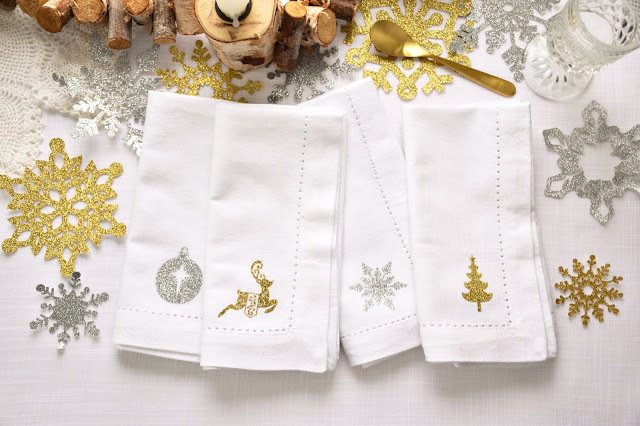 Your napkins turned out gorgeous! Can't wait to try my own. Oh wow, these are gorgeous! Definitely would never think it was homemade. Wow! I love this! Especially the snowflakes. 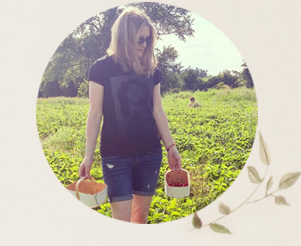 I am seeing SO many projects from Cricut these days - I would love my own machine! There is SO much potential for projects! These are gorgeous! I see so many great things being done with a Cricut now, the possibilities really do seem endless. Beautiful! I love making my own decorations too but these are incredible, I wish I had talent like this! Wow I love this decor! Beautiful! I don't have the time or talent to add many DIY touches, but they do look lovely!